Facilities in all villas include spacious living areas, private swimming pools or jacuzzis, luxurious furnishings and fittings, modern entertainment centres with DVD and satellite televisions, WiFi internet connection and more..
In-room dining service is available from our fine dining restaurant, with delicious meals and snacks served in your dining room or by the pool. We can also stock your villa with a range of foods and wines of your choice. This superb, contemporary 2 storey Villa is only 10m from the pristine white beach and has 3 double bedrooms, each with in-room safes, en-suites with freshwater showers, A/C, DVD/CD player and Satellite TV. Downstairs is the expansive living and dining area with DVD/CD player and Flat Screen Satellite TV, leading onto a wide sundeck with sun lounges and the 10 x 3 metre freshwater swimming pool. 2 traditional wooden lounging Bale’s provide a space for cool reflection. The kitchen has intercom connection to reception, a fully stocked fridge/freezer, glasses, crockery and cutlery. The master bedroom is also on this level and has built-in robes, and an en-suite bathroom with marble vanity. The upstairs relaxation area overlooks the pool and has picturesque views across the water to Lombok. Each double bedroom has an enormous en-suite bathroom, one with bath and shower. 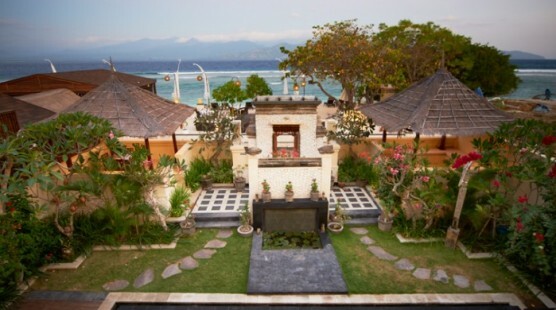 Step over an ornamental water feature into Villa Asoka. The 2 spacious double bedrooms with built-in robes, A/C, DVD/CD players and Satellite TV’s have en-suite indoor/outdoor Balinese bathrooms with marble vanities and freshwater showers. The open air living area has DVD/CD and Satellite TV adjacent to the kitchen with intercom connection to Reception, fully stocked fridge/freezer, glasses, crockery and cutlery. A sunken sun bed lies in the water leading into the 6 x 2.5 metre freshwater pool, surrounded by wooden decking with additional sun lounges. 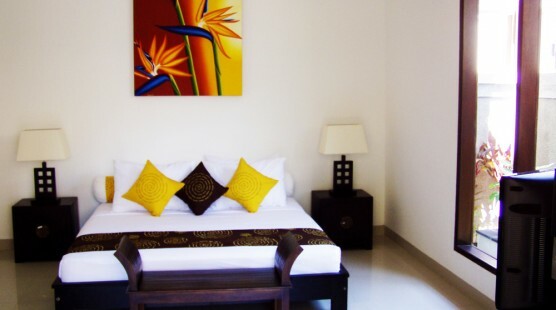 Villa Alamanda has 2 double bedrooms with built-in robes, A/C, DVD/CD players and Satellite TV’s. 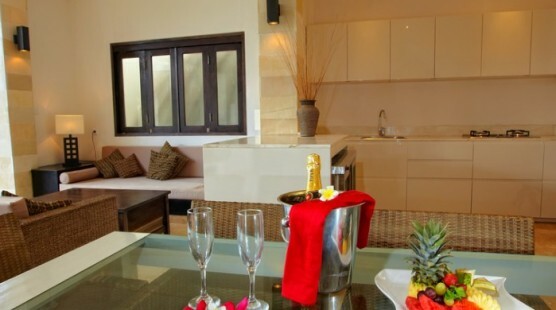 Each bedroom has an en-suite with indoor/outdoor Balinese bathroom with marble vanity and freshwater shower. The fully tiled living and dining areas have all modern facilities including built-in entertainment unit with DVD/CD player and Satellite TV, fully stocked fridge/freezer, glasses, crockery and cutlery. Relax in the traditional wooden Bale or on the deck surrounding the 4 x 2 metre freshwater pool. Large and spacious, Villa Ganesha is accessed via a magnificent sculpture of the Hindu God Himself, majestically standing guard before the enormous 9.5 x 3 metre freshwater swimming pool and deck with relaxation Bale. Contemporary furnishings and design complement the open plan living and dining areas with TV, DVD/CD player, Satellite TV, WiFi internet and i Pod docking station, and kitchenette with tea and coffee making facilities, cutlery and crockery. Each exquisite double bedroom has walk-in robes, A/C, DVD/CD player and Satellite TV and a large en-suite featuring indoor/outdoor Balinese bathrooms with freshwater showers. Villa Cempaka’s 5 x 3 metre freshwater swimming pool has a luxurious sunken sun bed for 2 and a large sun deck with additional sun lounges, surrounded by gardens. The spacious open-plan living area overlooks the garden and pool and has DVD/CD player and Satellite TV. The kitchen has a fully stocked fridge/freezer, glasses, crockery and cutlery, as well as intercom connection to Reception. Both double bedrooms have built in robes, A/C, DVD/CD players and Satellite TV’s, together with en-suite bathrooms with marble vanities and freshwater showers. The master bedroom has a large open-air bath. Enter Villa Sakura through tropical gardens and past the 2 x 4 metre freshwater pool into the cool and airy living and dining area. The open-air living area has DVD/CD and Satellite TV adjacent to the kitchen, with intercom connection to Reception, fully stocked fridge/freezer, glasses, crockery and cutlery. Each double bedroom has built-in robes, A/C, DVD/CD and Satellite TV with en-suite indoor/outdoor Balinese bathrooms, marble vanities and freshwater showers. With its lush gardens, relaxing Bale by the 4 x 2m freshwater pool and wide sun deck with sun lounges, Villa Mawar is a haven of peace and quiet. The 2 spacious double bedrooms with built-in robes, A/C, DVD/CD players and Satellite TV’s have en-suite indoor/outdoor Balinese bathrooms with marble vanities and freshwater showers. The spacious open-plan living area overlooks the garden and pool and has DVD/CD player and Satellite TV. These one bedroom contemporary private Villas are fully tiled and have spacious double bedrooms with DVD/CD and Satellite TV’s, en-suite bathrooms with marble topped vanities and freshwater showers. The outdoor relaxation terraces have fully stocked mini-bars, tea and coffee making facilities, dining table and chairs, and lounges. 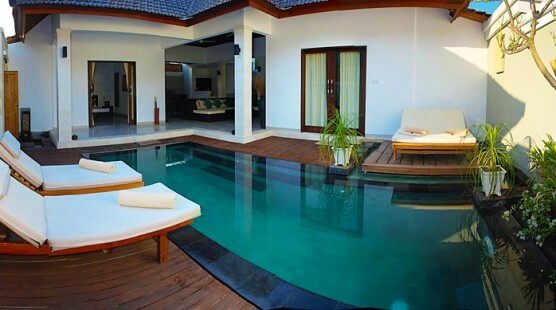 Each terrace flows onto wooden decking with sun lounges and either a large plunge pool or personal Jacuzzi (Villa Hijau). Cancellations made 3 days prior to arrival will incur a one (1) night contracted room rate + 21% tax and service charge. Cancellations made with less than 3 days notice and voluntary No Show will be charged as per total room nights booked at contracted room rate + 21% tax and service charge.